While I'm biking around Hokkaido this month, Van Waffle, a Canadian writer, blogger, and food-foraging-fun-guy, agreed to share some of his favorite seasonal fruit hunting. If you like this, check out his earlier post on the natural beauty of Guelph's two rivers. Better yet, cruise on over to his blog, Speed River Journal, for more recipes, reflections, and all around good writing! Enjoy! Rose hip jam ready for toast! My favorite seasonal foods are summer fruits. During hot weather, the opportunity for foraging pulls me out of air-conditioned shelter. The dog days of summer may be the best time for foraging in the city. Some property owners cannot be bothered to pick their own cherries, plums, pears, apples and other stone fruit. (Be sure to ask permission to collect anything from private property.) My partner and I went looking for mulberries, but returned with something unexpected: rose hips. Foragers cannot rely too heavily on a grocery list. I doubt we will find any delectable oyster mushrooms during the great North American drought of 2012. Still there is plenty to find around the city. Be observant and prepare to experiment—with a good field guide in hand, of course. This week I discovered peppermint in some marshy ground in the park; also a population of stinging nettles to satisfy my hankering for pesto d’urtica next spring. 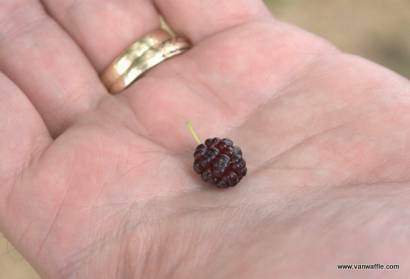 Keep an eye open for mulberries in late July and early August. They are sweet, flavorful and worthy of a pie. Various species are scattered in temperate and tropical regions of the world. I grew up with two venerable red mulberry trees beside our house: sprawling beasts with massive trunks, perfect for tree forts. The fruit attracted orioles, cedar waxwings and other birds. For several weeks every summer the berries turned our patio and bare feet blue. I grazed but my mother, lacking any recipe, never cooked with them. Sadly, both trees attracted lightning. Red mulberry is endangered in Canada. Guelph lies at the northern extreme of its range. I do not mind climate change making Ontario a better environment for this and other native Carolinian species. I know of two mulberry trees in the city, so we went looking. Parking the car on the right street, I noticed a long hedge of rugosa roses covered with red hips. Unfortunately, we found the mulberry’s branches practically bare. I do not know whether to blame drought, birds or sharper foragers. A quart of fresh rose hips ready for jammin'! We turned instead to the prolific rose hedge. Most of our native species produce small hips hardly worth the trouble. Rugosas are a hardy, salt-tolerant, disease-resistant Asian species favored for landscaping. 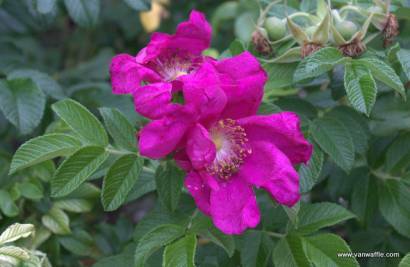 The shrubs look coarse and the petals are boring pink, but the flowers are intensely fragrant and good for potpourri. I had also heard their plump hips are great for cooking. Last frost is supposed to be the best time to harvest, but these bushes were visibly drought-stressed so there would be little advantage in waiting. I tested one. The flavor was bright and zingy as the color, slightly spicy. We easily picked two quarts. Rose hips contain more vitamin C than oranges, and lots of natural pectin. The hairy seeds can irritate both skin and gut, but are high in vitamin E. When dried, rubbed to remove the hairs, and ground they can be used as a natural supplement. We had never cooked with rose hips before, so opted for simple jelly. Once they had simmered, my mother’s old-fashioned cone sieve with masher did a great job on them, but a potato masher will also work. The fruit has lots of flavor but sweetener is required. 1. Wash and sterilize 6 half-pint canning jars and lids. 2. 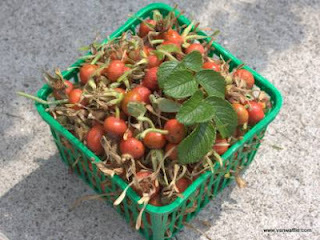 Remove rose hip stems and tops and rinse. Cover with 1½ quarts of water, bring to a boil and simmer for 90 minutes (less for smaller-hipped rose varieties) or until they are soft. 3. Strain through cheesecloth and reserve the juice. Mash the hips. Drain the pulp for at least an hour, collecting any liquid. Strain the juice through cheesecloth and measure. If necessary, pour more boiling water through the pulp and strain the runoff to obtain a total of 3½ cups of juice. 4. Add lemon juice and pectin and stir to dissolve. Bring juice to a boil. Add sugar. As soon as it dissolves add butter to reduce foam. Bring to a full boil that cannot be stirred down. Boil exactly one minute. 5. Pour jelly into sterilized jars. Apply lids and rings. 6. Process in a boiling water bath for 10 minutes. Let cool overnight. Check the seals. If a lid does not seal, refrigerate the jar and use within three weeks. Otherwise they can be stored in a cool, dark place for a year. With so much natural pectin, the jelly started to form as soon as we took it off the heat. The flavor is delightful, something like apricot marmalade. With a little more trouble (seeds carefully removed), rose hips would make great jam. They would also combine nicely with other fruit or herbs, and lemon balm or verbena would enhance this jelly nicely.